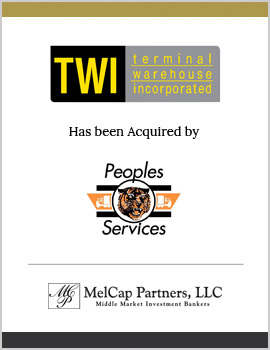 Terminal Warehouse Incorporated (“Terminal”) is a warehousing and distribution specialist that provides quality, cost-efficient public/contract storage and distribution related services. Terminal represents a unique niche market that handles various chemicals, with an expertise in hazardous material storage. MelCap Partners acted as the sell-side advisor for Terminal. The Company was sold to Peoples Services, Inc. (“PSI”). This creates one of the largest warehouse/distribution businesses in this region.